We mentioned before in various places about the imminent closing of NZBS.org, the USENET indexing website. 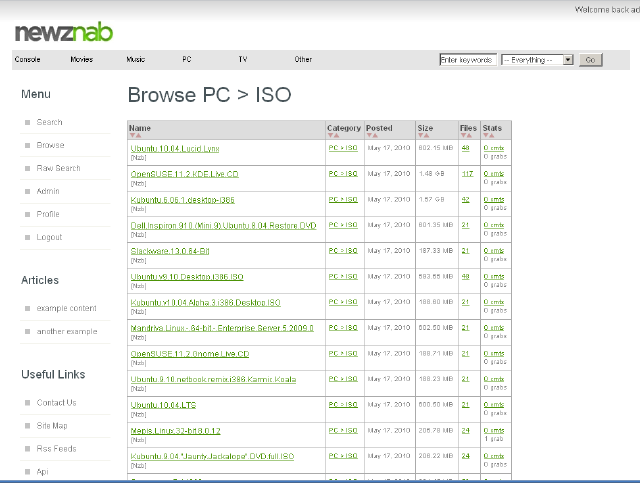 Well, if you are having problems finding a good NZB index, or just always wanted to build your own USENET index, private or published on the web, NewzNab is probably the index building software you need. Most of the most popular USENET indexing sites use this as it allows for creation on a modest server. If you wish to keep your index private it is possible, but there is always room for a new public indexing site. It takes an Apache server to run this software, but virtually any Apache server will do. If you have a weaker server then you may want to consider creating an index carefully. It has been discovered by many already that backfilling operations can be a tediously slow operation. For people just wanting to play around and create what they can in private, or someone wanting to get serious about a publicly accessed USENET NZB index, NewzNab may just work perfectly. NewzNab has a free version that works well in almost any situation. Adsense and Google Analytics is also supported for your site if you so wish to build something real to be placed online. All USENET member complain that there needs to be more indexes available, who knows, you may just get lucky. Bringing you the latest reviews and information from the USENET Scene since 2007.